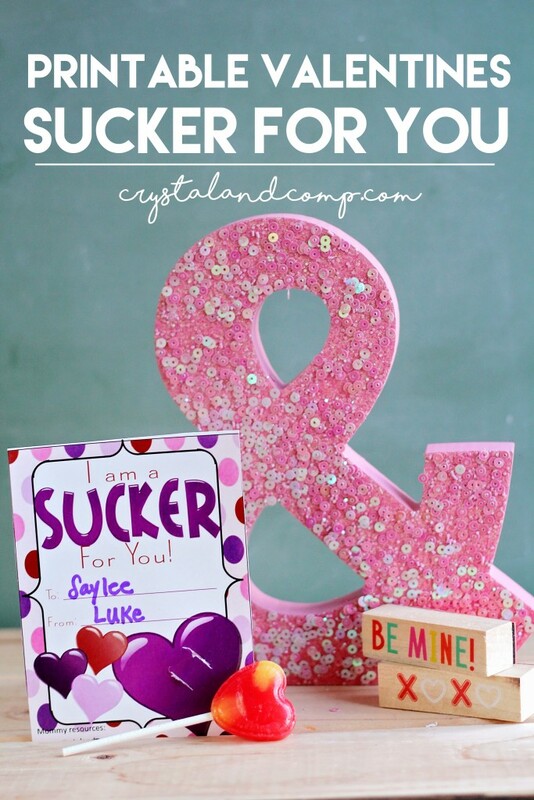 Have you seen all of the printable Valentine cards for kids we have here on Crystal & Co.? They are perfect for helping you celebrate a class party or Valentine’s Day with friends, neighbors and family! Many of my crafts include free printables that make awesome goodies! Today’s printable goes perfect with a Dum Dum sucker. The message is perfect- I am a Sucker for You! These are perfect for your kiddos to hand out at school. I just adore them! Kelli from 3 Boys and a Dog makes all of my printables. She does awesome and affordable design work. There are four cards on a page. Cut them out using a paper-cutter or scissors. Fill in the from and to area of the cards. I love that we have two different designs on one sheet, don’t you? Using a craft knife to cut slits where the white lines are on the big heart. Feed the sucker stick through the slits. These are so cute! Thanks for the printable! Visiting from Skip to my Lou. Kim- thank you so much! Glad you stopped by. So so cute! Thank you! Oh. My. Goodness!! These are so stinkin’ cute!! LOVE them!! These are too cute! 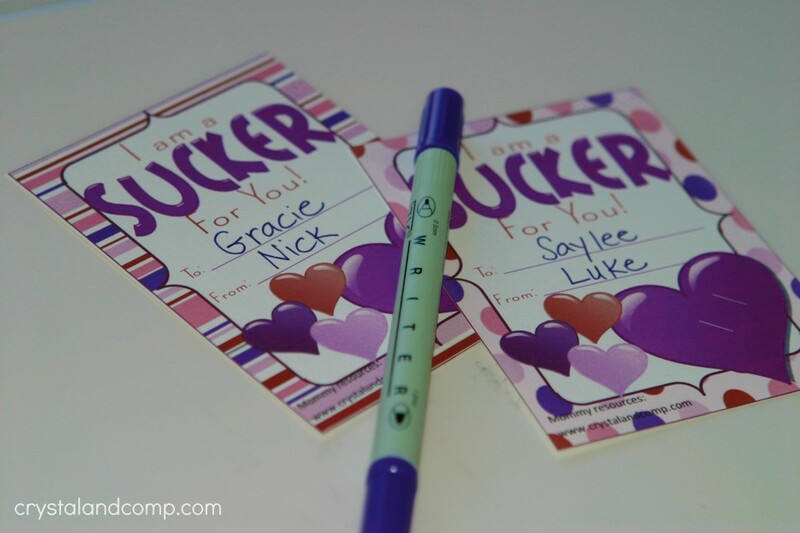 I recently made some similar ones with crayons and I love the idea of getting a sucker, too! Thank you so much, Amberly. Cute printable! I bet kids will love these! Ha! I am a sucker for a pun these days. Too cute! Thanks for sharing at After School! What a great idea and printable! What a cute idea. Children don’t give Valentine’s to each other in the UK but I wish they did as these would be perfect! These are great printables for Valentine’s Day! I really love these and I’m sure my kids would love to take these to school. Those are so cute. Around here, kids can’t bring food into school to share anymore, but I wish they could. These would be perfect. Those are adorable! I’ve got to print up a bunch of these for my kids’ Valentines this year. Thanks! Aww, these Valentines are adorable. 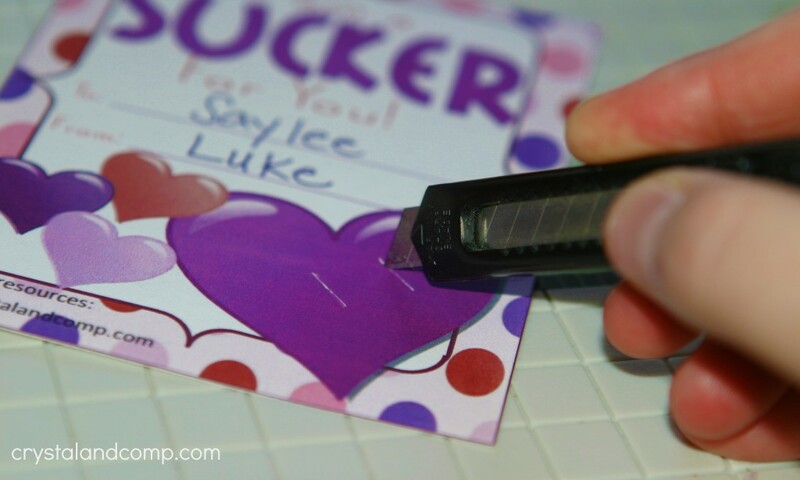 I always thought it was so fun handing out Valentines to my classmates. This looks like a great and wonderful printable. I have a friend who will love this. I’ll refer her here. I am seeing so many cute Valentine’s ideas. I want to do them all!! We are looking for some cute valentines to give out to my sons class. He’s a very cute to print off and give to all his friends. Thanks for the printables! These are seriously cute. Great giveaways for teachers, co-workers, and kids too. We don’t have to spend much. Being creative goes a long way! I love this idea!! I love pairing the card with the sucker and those cards are super cute!! Great idea!! These are so really cute. love those printables and i want to try this. Those are so cute. I will have to show this to my daughter, she love this kind of stuff. These cards are so cute. I will have to print some up for Valentines day. I love printables. SO cute! Thank you for the printable card! Valentines day is so fun! Esspecially with cute cards like these. What a cute idea! I would love to print this. The girls can give them to their classmates on Valentine’s Day. So cute! I love printable Valentines. Those are super cute! They remind me of the ones we bought as kids and passed around the classroom on Valentines Day. What a cute idea. My kids will like this. We do something fun every year for their classmates. These are really cute VDay printables! I will print this for my kids and for me, I’m giving these to friends too! These are really cute. I bet my wife would surely love to make a valentines card. This is really cute!! I think my daughter would love it! Such a great idea and the printable looks cute as well. A wonderful stuff for Valentine’s Day & my kids are going to love it so much. A nice gift idea to share with your loved ones as well. These are awesome looking! What a great idea. 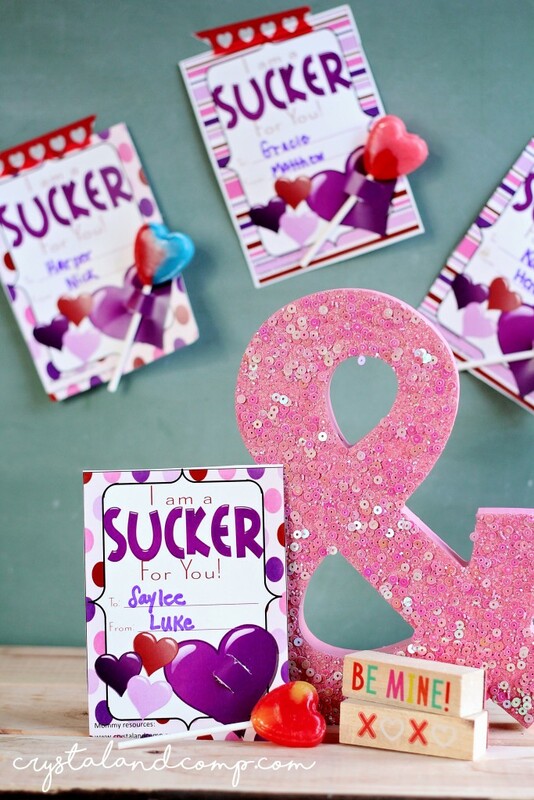 They would be perfect for any class valentine party! That is so cute. What a great way to give a valentine. I love it, and the kids would love making it. A super cute idea for a classroom. I am going to need to make some DIY cards this year for my son’s class! These are so cute! Shared in my roundup today for Dream Create Inspire. Thanks for linking up with us! Adorable. Love that you make these available for free. Thanks for linking up at #SaucySaturdays!